STONE RIDGE — Sivon Diconcilio remembered last year’s MHAL semifinal like it just happened. The Blue Devils blew a 20 point first-half-lead and lost to Millbrook by two. When the final buzzer sounded, he fell to both knees, and grasped his face filled with tears. The passionate co-captain felt as if he let his team down, scoring 11 points on 3-of-9 shooting. He didn’t want that night to define him, and vowed to himself that he’d do everything in his power to help his team win the coveted MHAL (Mid Hudson Athletic League) title. After the tragedy, came the triumph. 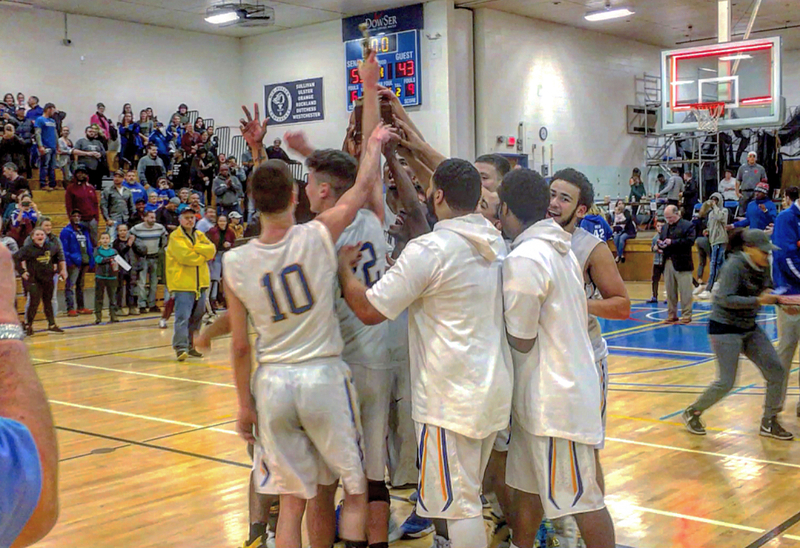 362 days later, Ellenville defeated New Paltz 55-43 to win its first MHAL championship since 1994. In the redemption game, Diconcilio scored six points on 3-of-6 shooting with nine rebounds, and six assists. “I didn’t want that loss to define who I was,” he said. Guliano finished with seven points, eight rebounds, and four assists. Ellenville won the game wire-to-wire, but they led by single digits for 31:02 of the 32 minutes. Defensively, the Blue Devils forced 13 turnovers. Head coach Bryan Bonitz thought that was the biggest reason for their success. The only loss Ellenville (19-1) suffered this season was against New Paltz (16-4) on January 15th. Since then, they’ve won 10 straight. 32 of Ellenville’s 55 points came from senior guards Jeremiah Figueroa (17) and Christian Villanueva (15), who combined for 7-of-13 from beyond the arc. New Paltz senior guard Casey Burke led both teams with 24 points (7/15 from the field, 9/9 from the free throw line). Both teams are the one-seed in their respective classes and will have a bye in the first round of the Section 9 playoffs next week. New Paltz plays the winner of FDR & Red Hook while Ellenville plays the winner of Liberty & Spackenkill.